Could you be using the summer sun to heat your home in winter? Your garden dirt as a heat battery! 2007: A Carbon-neutral London Home for 50 Grand? What you need to know about GSHP, and a real-life domestic installation in western France in 2010. Domestic Air-Source Heat Pump (GSHP): Reviews? As of the start of 2012 we're about carbon-neutral on energy, with the excess exports from our PV compensating for our gas combi. We've reduced demand (ie increased energy efficiency) greatly, but I'd like to stop directly burning fossil fuel (ie gas) directly, soak up more energy solar locally to reduce grid demands further, and rely on decarbonisation of the electricity grid to green us further. All that implies some sort of heat-pump plus solar DHW. Justin Broadbent of Isoenergy visited (2012/01/23) and he pointed out that a heat-pump would be unlikely to save money (but we ought to wait until June to see the RHI details), that an ASHP might get us an SPF of 3 if done right but that a GSHP with borehole(s) might cost the same and have an SPF of 4 (combi style with ~200l thermal store with direct solar inputs), and that it might cost us something like £18k all in. An important assertion was that we could probably run our rads in the low-40s(C) more constantly (in contrast to the low-duty-cycle boiler cycling we get now) if we plan slightly ahead and leave more time for rooms to warm up; doing so would help maintain the heat-pump's SPF. I had been concerned that no GSHP boring machine would be able to get to us, but it seems as though that isn't true, and a 100m borehole might well do us. £1k on upgrades to older radiators, and other improvements. This does not include any solar thermal costs. Taking halfway between the harsh 2010 (~6MWh gas) and mild 2011 (~4MWh gas) and indeed hoping for further efficiency improvements with new glazing, etc, average demand from gas has been ~14kWh/d apparent, or ~11kWh/day actual allowing for our ~80% (or lower) gas combi efficiency. Tank losses with the GSHP might be ~1kWh/day so taking us to ~12kWh/d total demand, and an SPF of 4 would take us to close to 1.1MWh electricity import. 5MWh of gas is currently ~£200 and 950kgCO2. 1.1MWh of ("100% green") electricity is currently ~£140 and ~500kgCO2. So at an SPF of 4 we might save a tiny bit of money and a little under half a tonne of CO2 each (moderate-heating-season) year. Assuming a system life similar to PV of (say) 20 years, that implies £900/y to save ~450kg/y (ie ~£2/kgCO2/y), compared to the PV of somewhat under £1/kgCO2/y, so it's expensive. Adding enough PV/T to remove 500kWh of DHW heat demand (approx one third) might avoid 125kWh of electricity demand and generate up to another 500kWh, saving possibly another 200--300kgCO2/y, and likely changing the economics (£/kgCO2/y) for the better. When I visited the Energy Solutions Expo I started thinking about use of heat-pump technology for heating. I had already estimated that as of 2007 I could just about eliminate our net household electricity use over the year with 4kWp of grid-tie solar PV to cover our ~7kWh/day consumption. We might even be slight net exporters. We could eliminate that portion of our 'carbon footprint' and over the course of ~25 years we'd probably recover the outlay of maybe £28k total (~£7 per installed Watt-peak (Wp)). We use about 10kWh/day of mains natural gas for cooking and hot water, and at least about the same again in winter for central heating. We're going to try to trim that a bit with improved insulation and avoiding overheating the house (eg we keep the central thermostat between 15°C and 18°C typically and the radiator/hot water temperature 60°C-ish), but it might be possible to eliminate almost all of the 'gas' power (ie its 'carbon footprint') with GSHP technology. For every 3--4kWh of energy extracted this way about 1kWh of electricity is needed to drive the pump mechanism itself with a typical CoP (Coefficient of Performance) of 3 to 4. With care, that might come from our PV (again, using the grid as 'storage'), at maybe about an extra 1kWp (mean ~2.5kWh/day) extra PV to cover each ~10kWh/day of heat pumping. At the 'e2' show I spoke to Cool Planet at their stand, but they don't normally do domestic-sized systems. I contacted some other GSHP providers in the UK, but, for example, one does not do replacement systems (eg to supplement an existing domestic hot water (DHW) and central heating system). I would estimate that with a floor area of 180sqm to be heated in a reasonably well insulated house you would need a 7kW output heat pump. This would require 2 x 60m deep boreholes. Our Greenline HT+C7 GSHP would provide all heating via radiators or UF heating and all DHW to a max temperature of 65 Degrees C.
We offer a design supply and commission service we do not install the systems ourselves. The borehole drilling company you chose would install the ground loops whilst a plumber of your choice would take care of the internal install. The design supply and commissioning of this system including the heat pump, the external pipework all manifolds and all deliveries to site would be approx £7000. You would also receive a grant of £1500 from N power. One company who have carried out the drilling for many of our clients is Jackson Drilling who are based in Somerset. The GSHP we sell requires Zero scheduled maintenance for its entire life. Therefore one of the main benefits is that as well as reduced running costs, no further outlay on maintenance is necessary. Supposing that we wanted to keep this entirely carbon neutral over the course of a year. That might be accomplished by total install costs of possibly £9k for the heatpump, boreholes, plumbing, etc, after all grants, and possibly another £14k of extra solar PV to cover the electricity used. So for (say) £23k we could probably neutralise all our gas use, a little less than the £28k estimate to neutalise mains electricity use (other than the heat-pump usage covered above). If those numbers are at all accurate, then for £50k we could possibly eliminate the carbon footprint of our small London house for power, with relatively little maintenance cost and effort over a probable 25+ year lifetime, though see the caveats below. Note that is also possible to add solar thermal to help with DHW, depending on overall system design. In effect, this would displace a little of the solar PV described above for driving the heat-pump. We are designing thousands of code  sustainable homes [and] level 5&6 zero carbon homes using various ground source heat pump systems but the technology and how the energy use and carbon emissions are calculated are very confusing, for instance to supply Domestic Hot Water you need a supply temperature from the heat pump of at least 70°C and no normal ground source system can improve much on a seasonal Coefficient of Performance of 1.8 for this. This means that for DHW generation the CO2 emissions are worse than gas if the heat pump is connected to the Nat. Grid though you could use renewables to supply the electricity but if you are relying on PV panels they will not produce anything like enough in the winter and you will be relying on a grid connection anyway. We continued the discussion by phone and he said that unless you get a CoP of 2.2 or better then in terms of atmospheric CO2 production it is better to burn mains natural gas for domestic heating including DHW. It seems that the claims of a CoP or 3 or 4, even for surface GSHP and low-temperature space heating are probably unsupportable. And boreholes are especially problematic since continuous heat flow into them from surrounding soil may allow the temperature to drop several degrees below the normal undisturbed 11°C mean, further lowering the CoP. As of January 2008 the French government has tied tax breaks to specific CoP targets (>=3.3 at specified temperatures), which seems one way to tackle the snake-oil element. My hope to 'store' excess summer solar PV generation in the National Grid (by displacing other non-baseload generation) and get it back in the winter may not be realistic because the winter peak-load requirement may require more carbon-intense generation (eg coal) and thus the cubic metres of natural gas burn that I defer in the summer may not be replaced with natural gas burn in the winter to power my heat-pump. In March/April 2010, after the government had announced its RHI (Renewable Heat Incentive) consultation and outline plans, a friend doing some building anyway was considering replacing his existing oil-fired central heating (with radiators) with GSHP (or AHSP). One problem is that most of the systems, especially GSHP, have a low maximum temperature (before an ordinary immersion heater is used) of ~55°C that requires radiators to be replaced with larger units. Basically they are more suitable for underfloor heating (UFH) in very well-insulated homes requiring too much upheaval to be practical, not being direct drop-in replacements for an existing combi, at least from my friend's point of view. The Eco-Cute ASHPs with high (>60°C) water temperatures at decent CoP are either unavailable in the UK (such as the Hitachi 'instant' unit) or don't have the correct MCS accrediation for the RHIs (the Sanyo units). Another problem is in getting the installers (etc) to behave professionally, actually come out and visit rather than waffle over the phone, etc, etc, to the point where my friend was disheartened enough to put off even thinking about it for another year, at least until the RHI levels are fixed. One interesting idea that Brian offered is 'simply' to take a 20,000l-ish second-hand stainless steel milk road tank, and bury it (well insulated) full of water (and maybe corrosion inhibitors) in the garden. In the summer, energy from solar thermal capture is pumped in, and in the winter pumped out again for space heating and DHW, and much less energy is required to pump the energy this way. Indeed, any excess RE year round, such as the dump load for a wind-turbine or even solar PV, that would otherwise be discarded, could be captured in the thermal store. This is much more efficient then trying to generate and store energy as electricity, for example, when all that is needed is heat. I have to do the sums for the energy capacity vs our energy usage and so on, but this looks like an interesting alternative to GSHP. Milk is good for you! See my system design sketch. What we really need are some good reviews of different GSHP products from start to finish in terms of cost, efficiency, install difficulty, long-term characteristics, and even customer service. A good 'controlled' study is hard to do, in part because it's not truly a mass-market product (yet) and finding two near identical sites for comparison is well-nigh impossible. No supplier is going to be offering free installs to 'prove' their product, and if they did, would you trust the reviewer? Here is a good start: the Energy Saving Trust 2010 heat-pump field trial. A number of respected people and organisations have said that in the UK there is not enough competition in the market and consequently there are too many snake-oil salesmen and shoddy installers. "Topher" (Chris S) in western France has very kindly allowed me to record some details in his words lightly edited (and show some of his photos) for his GSHP installation in August 2010 (pompe à chaleur). See more detail in this Green Building Forum thread. It is a 15 KW 3 phase heat pump made by Nibe in Sweden, but badged as Atlantic - the distributor in France. It will be supplied by two 100 meter vertical bore holes drilled through water courses, but will use a closed circuit supply of two pipe loops per bore hole. Topher supplied some log file outputs for about 3 days from 2011/02/23. Topher's note on the meaning of logging parameters (from the Nibe Manual). Of my two bore holes one is 102 meters the other is 95 meters deep. Both will be connected to a manifold, then from the manifold to the heat pump in the house. I am keen that the pipe lengths to both bore holes are equal, so that the flow to both bores are equal to get the best possible heat transfer. So the horizontal trench for the 95 meter deep bore hole needs to be 7 meters longer (102 - 95 = 7 meters). I am hoping to get this by having a zigzag trench from the 95 meter bore hole. Just one zig, not too difficult. At this point Topher made the terrible error of confusing me with someone who knows anything on the topic and wondered if it was important to have the same length pipe runs of it 7% was ignorable: ah, if only I knew! Work started today. A huge amount of stuff arrived. Fittings, inertial cylinder, many containers of antifreeze, and so on. The trench route question has been solved. The lengths of the pipe runs to the bore holes will be be the same, there will be just a short length of trench where all 8 pipes from the boreholes will be together. I have told my French Heating engineer about this blog and he is going to read it. Who knows he might even contribute a bit too. Due to the house layout, the best position for the heat pump and 200 litre inertia tank is in a loft space on the first floor. There is plenty of room in the loft space, but it needed 5 people to lift the heavy heat pump up the stairs. This was done with efficiency and good nature by the team. Today, Dominique and Pierre are connecting lots of pipework. Tomorrow a new person will be digging the trenches for the borehole pipes to be connected to the manifolds and then through the wall, into the house and up into the loft space. I will be connecting a 'Current Cost' energy monitor (Model CC128 ENVI) to the three phase supply to the heat pump. I hope to record every single watt that it consumes. I am very aware of the huge loudspeaker that the floor of the roof space makes to the visitor's bedroom below. Previously I was planning to have a heat pump made by a French Company called GéoThermic. I visited the factory and listened to the noise it made, it was significant. I was planning to have it mounted on hangers on the very solid wall (1 meter thick) with insulating pads. I also visited a neighbour who had a very noisy heat pump (much louder than a fridge) in their kitchen. They were annoyed about the noise, but had grown used to it. Then I discovered Atlantic - they import Nibe heat pumps from Sweden. I was able to visit the classroom where they teach installers about the product. Using the inaccurate measurement of my ears, they are as quiet as a fridge. The compressor and heat exchangers are inside a sealed metal box. It must have a great deal of sound insulation. The heat pump will be on additional sound insulating feet on a thick base of high density chipboard which will be on the floor of the roof space. The Atlantic spec says the noise level is 21 dB(A). In the garage are eight 20 litre containers of antifreeze for the borehole circuits. The heat pump supplier recommends protection to minus 15 degrees Celsius. Some of the containers are pre mixed at 33%, others are neat glycol. The glycol manufacturer says that a 30% mix gives protection to - 15 Degrees C.
I took a sample of the 33% mix and put it in the freezer. My freezer has -16, -18, -20, -22, and max settings. I do not know how accurate the control is. At -16 and -18 it stayed as a bright pink liquid. At -20 it has now become a slush. Normal winters here get to -4 or -5 degrees, but mostly hover around zero. My neighbour who has been here a long time, said that once it got to -15, but that was very rare. So I think it will be OK. The borehole installation is covered by AXA insurance for 10 years. I was surprised to see that they do not demand a certain antifreeze concentration. Trenches were supposed to be done yesterday but the digger driver was not available. He is here today, and my rather badly maintained garden is being destroyed. It will re grow. The heat pump COP is quoted as 4.25 at 35 deg Celsius. I have underfloor heat so I will run at 35 deg or less. At 35 deg, the heat output is quoted at 15.42 kW. So if I understand correctly, I will take 15.42/4.25 = 3.63 kW from the electrical supply and 15.42 - 3.63 = 11.79 KW from the 95 and 102 meter bore holes. I need 11.79 kW from the bore holes. Bore hole 1 (95 meters) and bore hole 2 (102 meters) give a total length of 197 meters. This does not include about 25 meters of trench at a depth of about 1 meter, which will provide a little more, but I have ignored it. So I need 11,790.00 watts from 197 meters, this comes to 60 watts per meter. I have 4 pipes per hole, no spacers between pipes, no grout in gray shale, and some layers of quartz, and clay. I think that both bores will be full of water. I was unaware of the availability of spacers, Had I known, I would have insisted on their use. They are only simple plastic things, which can't cost much. They will increase the time taken to lower the pipes into the hole, but not by much, say 15 minutes max. If you don't use spacers pipes will probably touch each other, reducing their ability to abstract heat from the surrounding ground. If you have a lot of horizontal trench from the bore hole/s to the heat pump, then put spacers on the horizontal pipes too. The trench will need to be a bit wider, hence more damage to your garden. But your garden will be wrecked anyway, so no problem. The garden is now totally destroyed - just the rather poor quality grass bits, the flower beds remain intact. I had expected it, but when you actually see it happen it is a surprise. Trenches have been dug that slope downwards towards the bore holes; at the deepest they are 2 meters deep rising to say 0.5 [metres] as they enter the house. Today the 8 pipes from the bore holes will be laid in the trenches, they will be filled with antifreeze, then connected to the heat pump via the manifolds. I have pics if anyone is interested. They will be topped up with antifreeze and pressurised with a pump as the circuit is closed. Dominique the boss will not allow a connection to the bore hole circuit for refilling with mains water in case of diluting the antifreeze. It makes sense. If I need to top up, I will have to buy a pump and get some correctly diluted antifreeze. The Nibe heat pump has a control that allows the primary (bore hole) circulation pump to run 24/7. This will be useful to ensure all the air has been bled from the circuit. Later on it can be set so that it starts 20 seconds before the heat pump. The heating circuit is almost complete. They are going to flush it out with mains pressure before filling with water and inhibitor. It is 9.15 am and Dominique is hopeful that the pump will be switched on today. I am doubtful, we will see. I was right. Installation was not completed on Friday evening as planned. However, Dominique worked his socks off pushing himself very hard all day long. There was power cut in the afternoon, heavy rain in the morning, and a broken underground rainwater pipe to be repaired - not helpful. Each bore hole loop is filled with the pink antifreeze mixture. When the pipe loops were put down the bore holes, the drillers put water in the pipes to make them [heavier] and assist their descent. At this stage of the installation, a small electric pump is used to force the pink mixture into the pipe. When clear water coming out the other end, turns pink, both ends are sealed. The next step will be connection to the manifold. Fortunately each pair of pipes has one plain and one with a longitudinal stripe. In this way, as long as all the stripes are connected to one side of the manifold, and the non-stripped to the other side, all will be well. Finally antifreeze will be pumped by hand into the closed system and the circulation pump started. Air will be bled out of the system and the correct pressure set. The neat glycol has to be premixed with water before being put in the pipes. Apparently if neat antifreeze is put in the pipes and expected to mix with the existing water, it does not. Slugs of antifreeze circulate with slugs of water. This is not like adding inhibitor to a radiator circuit. Work will re-start on Monday and take 2 or 3 days I expect. I am concerned about the garden being left in the best possible state. The trenches have taken up lots of space and clearly they will have the bright red clay surface. I would like the non trench areas restored as well as possible. There are some piles of soil - for example near the bore holes where the fine material was pushed out from the drilling process. I am hoping I can get Dominique to encourage the digger driver to do the best he can to get a good result. When the installation is finished and the heat pump commissioned, a stage payment is due. The final payment will be made on the 1st December when the system is working correctly and keeping the house warm. I have learned something today that I wish I had known before. If you are having ground source put in an existing house, plan very carefully the clearing up of the site afterwards. If one contractor is doing both the borehole and the heat pump installation, it will be easier. The trap I fell into was that the hole boring people said that all the material that came out of the bore hole would be used by the people that dug the trenches as it was a fine sandy consistency and would go well with the pipes. Now the people doing the trench say that the hole boring people should have removed the material from the bore holes. I am trying to get Dominique to give what was once a poor grass area the best possible tidy up before leaving. We will see the result in a few days. We are at the beginning of day 7. Virtually everything is connected up. The primary (bore hole) and secondary (underfloor) circuits are pressurized to just over 1 bar. Outside the inspection chambers for the two bore holes and the manifold remain to be completed. Dominique worked hard on the digger yesterday to try and make the site as good as possible. There is lots for us to do to get it flat and in a state for the grass to regrow. The heat pump (made by Nibe, Sweden) is not yet connected to the supply. It has a very super little facility - three current transformers for the three phases, they go over the incoming supply wires to the house. The heat pump is set with a max incoming current value, which is the same as the rating for the supply. If the heat pump load were to cause an over current, hence a blackout in the house, it reduces and redistributes supply across the phases to ensure that the max current is not exceeded. Cool eh? Only on the 3 phase machines. In France, one factor that affects the tariff is the max kW of the supply. If you exceed the max, it trips, and you have to switch off the offending device before re-closing the circuit breaker. Some people have relatively low supply to save money and do their load regulation manually. When we bought the house we had a 12 kW (3 phase) supply and would ofter exceed the max of 4 kW per phase. When we switched to the Tempo we upped it to 18kW and now have no problems. It is another example of the way the French control their maximum demand. Day 8, bright and early (8.15 am) Dominique and Pierre are working again. Both primary and secondary circuits are connected and have held their pressure. Final electrical connections are being made. The Nibe 3 phase models have current sensors for the incoming mains, so that if the potential consumption of the heat pump would exceed the max of the supply, the heat pump changes its phase distribution or waits till the house load has fallen. The current transformers have to [be] fitted to the three incoming power cables, in my case a very full consumer unit (old style with fuses) does not have enough space. I am considering having it replaced which would give me circuit breakers and space for the current transformers. I expect it will be very expensive. I may not do it. Now it is lunch time and the heat pump has been powered up. Everything seems to be working except the connection to the room thermostat. The control interface is really good, a full colour display and intuitive controls. Dominique says it is far better than another well known make. At first power up, the system takes the installer through a commissioning procedure. The compressor has run briefly and in the limited time available to listen, I expect no problem with noise. The two circulating pumps are proportionally controlled, so no adjustments are needed. As I type the primary (bore hole) pump is running to get rid of all the air. My current monitor is showing 155 watts. So far I am very impressed with the Nibe product, although the manual does not correspond with the screen images - usual software documentation problem. After nine and a half days work, it is done. Dominique and Pierre have left. You may think that 9.5 days is a long time, it is, but it was all solid work. Installing in the attic of an old (200 years) farmhouse was difficult. A new build would be much easier. The Nibe heat pump is really excellent. It has many features, all easily controlled from a user-friendly colour display. Each screen has its own help screens. One very minor negative point - I had asked for a room thermostat. Normally the user adjusts the heap pump controls to get the desired temperature. The room thermostat with colour screen, would not communicate with the heat pump. Reason - down level firmware in the heat pump. Very quickly the Atlantic (French distributor of Nibe), sent me the correct level programme on the internet. It was transferred to the heat pump with a USB key. Cool eh? Perhaps the next generation will be connected to the internet, it would give remote update, remote control, and error reporting. Last night I set the thermostat to 30 degrees to try and get the heat pump to start. It did. We had a hot night as underfloor heating has huge thermal inertia. It is very quiet. My concern about the floor of the attic space where it is installed, acting as a sounding board to the rooms below is totally dismissed. You have to stand in front of it to know it is working. Both circulation pumps are software controlled. At the moment both are running 24/7 for 10 days to get all the air out of the circulating water. After 10 days they will return to automatic operation. In late November, when it will be colder outside, Dominique will return to check that the system is working correctly under heating conditions. At present with outside temperatures of 17 to 26 degrees, it is doing nothing. My plan to pay 40% at the start of work, 50% at installation complete, and 10% at the beginning of winter when correct working can be proved, seems to be working well. It is really dead obvious, but when you experience something directly, it reinforces the well known rule - "The more preparation you do, the better will be the result." I wish I had learned more about the bore hole technology and discovered spacers. I also wish I had thought more about making the ground good after the trenches had been filled. If I had, I could have been more precise with agreements with the hole driller and the heat pump installer. The weather is cooling here and I have found the heat pump has been coming on at night. I have reduced the thermostat setting to try and prevent this. Using power monitors is of no use in measuring real power consumption as people have told me. So I am planning to buy a PRO 1250D 3 phase kW Hour meter to measure the true consumption. Cost including VAT and delivery is £90.65 (GB Pounds). If anyone can suggest a cheaper alternative, I would be grateful. In some places on the primary circuit there are unlagged parts, for example the filter and valve unit. When it is humid I get condensation which drips on the floor. I have to make up a little device to catch the drips. Both primary and secondary pumps are still doing their 10 days 24/7 continuous running to get rid of the air. The temperature of the primary water is 14 degrees, so in the depths of winter the heat pump will be starting to raise the temperature from 14 degrees up to 35 which is the max set for the underfloor heating. I am hopeful of low energy costs. The 10 day continuous running of both circulating pumps has now ended. They were totally silent to my old ears. I thought I might switch it off for the first time and see what the 'CurrentCost' consumption monitor (not an accurate measurement) showed. So in the non heating season, switch it off at the circuit breaker. On Wednesday 20 October I installed a [kWh] meter and put the heat pump on. It was the first time it had been used to heat the house. It worked fine and brought the house up to 19 as set on the thermostat. I spent some time trying to understand all the different parameters that could be adjusted. I have a lot more to learn. Everything was fine until Friday, when I noticed that the pressure in the primary (bore hole) circuit had dropped to about 0.2 bar. Previously it had been solid at about 1.5 bar. I opened the inspection cover where all the bore hole pipes are joined to a manifold. If you look back, you will see the picture before the cover was constructed. There were two small pools of red liquid - the manifold was leaking. I told the installer and he said that it was probably caused by the low temperature on the return side. When the heat pump is running the supply side is 9 to 11 degrees, and the return can be minus 2 degrees. It makes me concerned about the leak security of the manifold. In normal operation the temperature will vary from about +11 to - 2 degrees, and if this change is sufficient to provoke a leak, then is this going to be a continual problem? I have seen a special manifold designed for this application. It has plastic pipe parts with electric resistance heaters which are used to melt the female socket to the inserted pipe. It would seem to give a much more secure connection. With 20:20 hindsight perhaps I should have insisted on one of these. Any one got information to add? It would be very interesting to hear about your experience. This Saturday morning the heat pump had shut down by itself. The alarm help screen said that insufficient primary circulation was available to work the heat pump. Last night I could hear slight noise of air in the system. I await the arrival of Dominique on Monday to fix the problem. Yes it really is unlucky 13. Dominique came today and re-pressurised the primary circuit. It was hard to get the pressure above 1.3 bar. The frequent drips coming from one of the manifolds changed to a small stream. Apparently it is a defect in the brass casting of a 'T' fitting. The frequent temperature changes, +11 to -2 degrees every time the heat pump cycles on and off, causes repeated expansion and contraction and has moved the defect in the casting enough to create a pin hole. Repair coming soon. The leak was caused by a brass adapter. It has an axial crack about 2/3 of its length along the larger female threads. I have it as a souvenir. Dominique says it is a very rare occurrence, but he has seen it before. I want to get a better understanding of all the parameters that can be adjusted and tweak the system to its ideal settings. I am concerned that the pump is short cycling. I want to increase the hysteresis so that it runs for longer periods at less frequent intervals. The short cycling was 5 to 10 minutes running only. This was reducing the life of the compressor so I turned it off. I contacted Nibe UK who were brilliantly helpful. Apparently I should have a return water temperature sensor about half way up the buffer cylinder. The 200 litre buffer cylinder acts an additional load, if I just had the relatively small amount of water in the underfloor pipes, the heat pump would rapidly reach the set temperature, causing short cycling. As a temporary fix I strapped a temperature sensor on the return pipe going the heat pump. It works fine and now the heat pump runs for about 30 minutes before shutting down. I await Nibe UK to say if it can be left as a permanent solution, or if I need to fit a tube to the buffer cylinder to take the sensor. When the pump has been running for some time, the water going into the under floor pipes is around 40 degrees. I think this is too high. My next task is to find out how to reduce this. I had to return to the UK in October 2010 for a family emergency. I am still in the UK, but will return to the heat pump installation in France at the end of January. While I have been away, it has been holding the house at 16 degrees as I had set on the thermostat with outside temperatures as low as minus 5 degrees. I don't know if it has been short cycling - I hope not - I will find out. On the question of how to connect the buffer cylinder, I have been struggling to get an answer from Nibe. At first I spoke to Nibe UK but could not get a clear response, so I was referred to Nibe Sweden. Finally today I made contact with someone in Sweden who really knows, and I am much clearer about what is needed. Series connection is OK if the secondary load is fixed as mine is. The reason for parallel connection would be if there were individual circuits which had control valves that might shut them down and set the flow to near zero, or zero. Clearly this would be bad for the heat pump. In a parallel connection a second circulator would be needed. 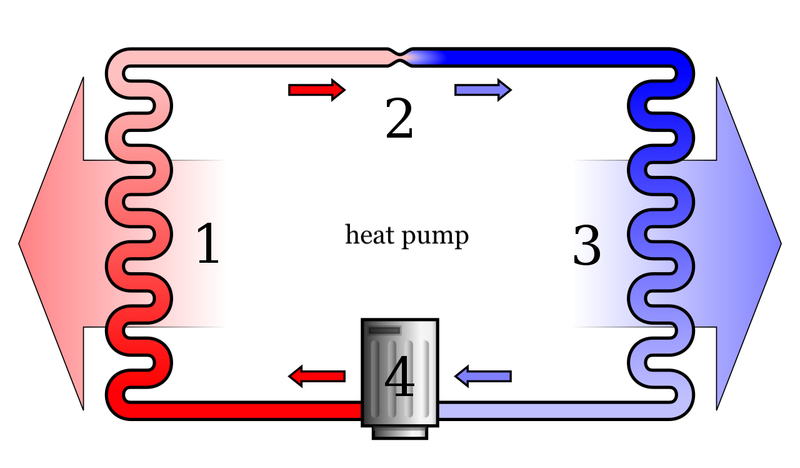 There is a circulator inside the heat pump which would pump into the buffer cylinder, the second circulator takes water from the buffer cylinder to the heat loads. The most important point I have learned is that the temperature differential on the secondary should be 5 to 10 degrees, with max of 12. When I get back, I will see what differential I have, and take steps to get it to the ideal. It is possible to connect an external sensor to measure water temperature. At present it is on the return to the heat pump. The technical expert said it could go on the supply side, and that I could experiment by first disconnecting it, and then trying it in different places. I will do this. After an absence of 3 months we have returned to France. During our absence the heat pump has been holding the house at 16 degrees, and I don't think it has been short cycling. I had hoped the temperature would be more like 12, but as I had to leave in a hurry, I had no time to check it. During our absence, EDF have had lots of red and white days (expensive units) but I console myself with the lower house temperature using less electricity. I have been studying the installation and discovered two problems. First the temperature difference (supply temperature minus return temperature) on the underfloor is too high. It runs at about 12 to 13 degrees. For a concrete floor it should be 5 degrees (7 degrees for wood). The way to solve this is to increase the flow. The secondary circulator in the heat pump is set to max, so an additional pump is needed. This high temperature difference causes another problem - the warm water output from the heat pump can get too hot for underfloor if the outside temperature is cold the heat pump has to run for a long time. I have measured 47 degrees - the ideal is 30 to 35. I am concerned that my very old underfloor pipework, and floor concrete could be damaged. The second problem is the connection of the buffer cylinder and the and the underfloor circuit. My underfloor circuit has no control valves that open and close, the flow is fixed. So the cylinder and floor are connected in series with the floor coming first then the cylinder, and finally returning to the heat pump. Nibe (heat pump supplier) say the cylinder should come first. Nibe use the supply temperature as the control to the heat pump, most other manufacturers use the return. So on St Valentine's day the pipework is to be modified and a pump added. Then on Wednesday an expert from Atlantic (heat pump distributor) will come and set up all the parameters. I will have some questions for him as you can imagine. If anyone is interested, I think I now understand the reasons for parallel and series connection of the buffer cylinder. Also, I think I understand the degree-minute system that Nibe use to control the start/stop of the compressor. This morning, the man from Atlantic arrived with my installer to carry out a commissioning process. I decided to pay for this (EUR350 more), because it increased the guarantee on the heat pump from 1 year to 3 years, with the manpower guaranteed for 1 year, plus I would be confident that it was installed and adjusted correctly. The Swedish Nibe heat pump (distributed by Atlantic in France) has a set up procedure which gets all the values set up according to the individual environment. For example there is a parameter which can be changed to reflect how good the house insulation is. I thought that my house, renovated 25 years ago, was well insulated---apparently it is not that good compared to modern materials. Change the circulating pump inside the heat pump to a more powerful version. I don't yet know if this is possible. In my view this would be the ideal solution. There is already a second pump in the circuit which was added yesterday to boost the circulation, but it is less powerful that the pump inside the heat pump. It is best if they both have the same performance. However the result may still not be enough, but it would be relatively easy to do. Change the connection to the buffer cylinder so that it is in parallel to the heat pump, with a more powerful circulator to pump from the cylinder to the underfloor. I think this would be certain to solve the delta-T problem, but it has probably has the most work to achieve. Below I have supplied an explanation of series and parallel connection of the buffer cylinder. This excessive delta-T is not harmful; it causes less than optimum performance, reducing the efficiency or COP of the heat pump. The man from Atlantic is responsible for advising the best solution. I am keen to hear what he says. OK. But a warning first - I am a retired electronics engineer, not a heating engineer, but I am fairly confident of my facts. It will be interesting to see if people disagree. I will do the buffer cylinder first, then the Nibe degree minutes separately. The buffer cylinder (BC) is used to give a sufficient quantity of water as a heat load for the heat pump (HP). My heat pump needs a minimum of 300 litres of water. The BC has 200 litres and the underfloor about 160, giving a total of 360. The BC can be connected in series or parallel with the HP. When in series, the warm water from the HP flows through the BC and underfloor or radiators sequentially. When connected in parallel the warm water from the HP flows through the BC and back to the HP. There is another circuit from the top of the BC through the underfloor/radiators and back to the bottom of the BC. This needs an additional circulating pump. In series connection the flow from the HP can be through the BC first or the heat load first. There is a lot of debate about which is best. Nibe is clear in drawings that BC is first then the heat load. Nibe controls the start/stop of the HP based on the supply temperature, I believe that most other manufacturers use the return temperature. If the heat load is underfloor this stops the temperature getting too high. If you have radiators, then perhaps they should be first as a higher temperature is desirable. If you have a heating load which varies, for example motorised valves which open and close then a parallel connection is needed. If it were to be connected in series and the heating load was suddenly shut down the heat pump could be damaged. In a parallel connection the BC can have a '3 pipe' or a '4 pipe' connection. The warmer top connections are always separate - one to the HP and the other to the heating load. In the '4 pipe' system the return side on the bottom of the BC are separate, in the '3 pipe' the returns are joined with a T connection to a single point on the bottom of the BC. Nibe Degree Minutes: more geekery! Same health warning---I am not a heating engineer. It might be helpful to take a piece of paper and draw the 'heating curve' and the 'degree minutes' formula described below to help understanding. My apologies if this is too long, but I am trying to be clear. Nibe---the Swedish manufacturer of my heat pump uses a number of parameters to control the compressor. Supply and return water temperature is measured with sensors. External and internal temperatures are measured in the same way. There is a graph of supply water temperature on the vertical axis and external temperature getting colder on the horizontal axis. This is the heating curve and represents the heat needed to keep the house at the correct temperature as the outside ambient varies. Looking at the curve, as the outside temperature falls, the supply temperature rises. The slope and offset of the heating curve can be varied; it can also have fixed upper and lower limits. With this flexibility, the heating curve can be adjusted to suit the heating needed by the house. Degree minutes are calculated every minute by the control circuit. The formula is actual flow water temperature minus the calculated flow water temperature taken from the heating curve. As each minute passes, the new value is added to the previous. Suppose the actual flow temperature is 25 degrees and the calculated temperature is 30 degrees. At the start, the degree minute will be -5. Suppose one minute passes and things remain the same, a new -5 is added to the existing, and we get -10. Things continue in this way until the degree minute value arrives at a preset point. Let's say the preset is -60. As you will have guessed this preset can be changed too. At -60 the compressor starts, and the flow water temperature starts to rise. When it gets to 29, a degree minute is -1. When it gets to 35, a degree minute is +5. These positive degree minutes eventually reduce the negative value to zero. At zero, the compressor stops. While the flow temperature minus the calculated temperature remains positive, the degree minutes become a larger and larger positive value. On my machine when it reaches +100 it does not get any bigger. I don't know why, maybe it is a Nibe fixed value. However as the flow temperature falls, because the compressor is now off, it eventually gets below the calculated value and now the degree minutes become negative. The +100 reduces and eventually gets to -60 which is the preset compressor start value and the cycle repeats. If you change the degree minute setting from -60 to say -100, then the hysteresis increases, that is the temperature has to fall further for the pump to start, and the temperature rises higher before it shuts off. It is not necessarily best to have low hysteresis because the pump will cycle on and off more frequently and compressor life will be reduced. Nibe say 20 minutes on, and 20 minutes off is ideal. As in life, the ideal is hard to obtain, as the on and off time depend on the external temperature and the sizing of the heat pump with respect to the heat load. Dangerous to put this in print, but I think it is complete. There are a few odds and ends to sort out, but it is practically done. Whew, it was started in August last year. The buffer cylinder is now connected in parallel with a three pipe system, and a more powerful circulator added. Nibe Sweden advised 3 pipe in place of 4 pipe as it would give the best isolation from the fairly powerful underfloor pump from the less powerful circulating pump inside the heat pump unit. I have an old gas boiler which I was using on EDF red days - red days are very expensive. I was advised to check the costs, and I found that the heat pump was cheaper (just a bit) than the gas using last years prices. I have to do an update on current prices, but I expect the same result. Amazing eh? I think so. I am recording consumption data, and learning about the logging that the heat pump provides. If you put the logging data on a spreadsheet you can plot graphs of temperature and similar things. I got back to France yesterday. House temperature was 14 degrees. I had set the thermostat to 12; I need to find out what parameter to change to get it right. With the low temperature setting and the warmish days, the heat pump has not been running much. If my calculations are right, the average run time was 14 minutes, and the average starts, 39 per week. I don't know if this is good, bad, or unimportant. What do you think? After having watched a compressor cycle at the unchanged thermostat setting of 12 degrees, (it ran for 11 minutes), I increased the thermostat to 19 degrees. Due to the sudden large demand, the degree minutes became a very large negative number (measured return temperature minus calculated return temperature from the heating curve). I had set -100 for pump start. It started, and as the difference was so large, the number got more and more negative while the heat pump output warmed up. When it got to -400 the auxiliary resistance heating cut in and the temperature rise got faster. Eventually the underfloor temperature got too high in my view, and I switched off by lowering the thermostat. I subsequently found that the resistance heating was set to come on at -400; I have left it there for the moment. There is a setting for max flow temperature and it was at 48 degrees, much too high in my view. I have lowered it to 32, but I still get high temperatures. It does not control the pump directly as you might expect. I need to study the operation to get it right. As the house is now close to 19 degrees inside, the temperatures are lower at pump switch off. I now see the reason for resistance heating. If you have a sudden demand for a big temperature difference, adding on peak electric heat will get there faster, but will cost more of course. Now that it is much warmer, the heat pump runs very occasionally, and I have discovered a new problem. Due to the high ambient, say 13 degrees, the heating curve will calculate a low temperature for the heating flow. This may be just a little above the actual temperature in the buffer cylinder. The result is a short run time for the compressor. Not good. I have found these ways of increasing the run time. Increase the degree minute setting at which the compressor starts. During the winter it was minus 60, I have now set it to minus 120. This means that the temperature in the buffer cylinder will have to get colder before the compressor starts, so it will have to run longer before switch off. Increase the offset allowed on the max flow temperature. Previously I had 31 degrees max on the heating curve and an off set of +10. This gives a max temperature of 41 degrees at which point the compressor stops regardless of degree minutes. I changed the heating curve to a max of 29 and the offset to +12. This still gives a max of 41 degrees, but allows the temperature to get higher by 2 degrees than the heating curve calculation or the max of 29 degrees. This seems to work. I now get a run time of about 20 minutes, I got 10 or less beforehand. I will have to wait until next heating season, to see the effect of this when it gets seriously cold outside. Always a compromise as we all know. I am still recording the consumption, but I am not sure how best to use the numbers. Next week I will switch off the system at the main circuit breaker. Just got back to the house after a period away. The pressure on the secondary underfloor heating circuit was unchanged. Good. The pressure on the borehole circuits was zero. Bad. This is the second time there has been a problem with this circuit. Previously the problem was a cracked brass pipe fitting in the manifold where 8 pipes from the two boreholes (4 pipes per borehole) are joined to the large diameter supply and return pipes to the heat pump. Dominique the installer said it was a defective part. Everyone else who has looked it it says it was overtightened. The high density black polythene pipes are very stiff and hard to manipulate. They are joined to the brass manifold with a threaded fitting which holds the pipe and compresses a gland. I understand this is an old technology used for the cold water supply into the house. It is possible to obtain plastic fittings which are melted to the pipe with a heating element enclosed in the fitting. As I understand it, the fitting has a bar code which is scanned, then a special piece of equipment passes the right current for the right period of time to form a good melted joint. This appears to be a better method of obtaining a secure joint. However if a problem does occur the repair is much more expensive. I have assumed that the leak is in this manifold. I could be wrong. It might be underground. I really hope not. Dominique came this morning to find out why I had zero pressure in the borehole circuits. He could not find any leaks. He re-pressurised the system to 1.7 bar and asked me to monitor it for any pressure drop. The explanation is that there was a pocket of air trapped in the system which had been there since installation, or had formed with air coming out of the water/antifreeze mixture. Eventually it moved to one of the automatic air vents and escaped. This caused the pressure drop. Let's hope this is the end of all the interventions and the future will just be using and tweaking. No the ground loops were not pressure tested. You have pointed out another lessons-learned item. With hindsight they should have been. The borehole company has a 10 year insurance with Axa so I may be OK from a cost of repair point of view, but I will have to suffer the upheaval if the leak is underground. The 8 pipes from the 4 borehole loops go into a manifold made from brass fittings (not welded - another lessons learned perhaps). One of these leaked previously but after repair, and for the rest of the winter heating season the pressure has been constant. It only dropped after the heat pump had been switched off - very strange. Yesterday and today is much hotter and the pressure which had dropped to 0.5 bar is now 0.6 bar. There are lots of things above ground which could be causing the loss of pressure. I think a pressure gauge would be a good idea, should not cost much. Get one with a pointer that you can set to the actual reading - much easier to spot a drop. You should also have a filter on the flow into the heat exchanger. When I had the first leak the heat-pump shutdown automatically as it could not get enough heat from the primary circuit. I am now on my third leak in the primary circuit. The first was some time ago, during the heating season, and was caused by a broken pipe fitting in the manifold connecting the black high density polythene pipes from the bore holes to the main flow and return to the heat pump. The broken fitting was caused by over tightening or defective brass in the fitting. The installer claimed the latter, everyone else said it was the former! The second was during the summer - there was a sudden loss of pressure. It was thought to be an air bubble because when the pressure was restored and the circulation pump run for 10 days, the pressure stayed up. About 8 weeks later, I noticed that the pressure was zero again. This time I could not get more than 1.0 bar because I ran out of the pink antifreeze. When I looked at the manifold, it was surrounded by the pink coloured water. I am now waiting for Dominique to find the leak and repair it. The inspection chamber is about 60 centimetres deep and has a small cover. It is very difficult to work on the manifolds because the space is so restricted and the pipes are very stiff. Four smaller pipes are connected to one big one and one manifold lies on top of the other. I am going to have a much larger inspection pit made, since it seems to need frequent visits. In hindsight I should have insisted on a plastic manifold with the pipes heat welded together. It might have been more expensive, but it would have been much more reliable. I am not sure about a pressure test, because the pressure has held up for weeks between failures. If you are having pipes jointed underground, I would strongly recommend all plastic fittings with the pipes heat welded. It would be interesting to read about other's experiences. Dominique came today to investigate the third leak. It was found to be a brass fitting. What I would call a straight one inch coupling, male to female. The flow and return manifolds are made up with one of these on each side. If you look at picture 10, dated 5 October 2010 you will see it. It is on the right hand side next to the elbow. So now both the flow and return have had the same fault. You can clearly see the crack on the fitting. I hope to post a picture in a few days. Both fittings have had the same longitudinal crack. So I seem to be the unfortunate recipient of two defective machined brass castings. Dominique has taken the fitting to his supplier to complain. He has borne the cost and time of making two repairs because of these defective parts. The system now has the primary pump running 24/7 for a few days at 1.5 bar. Fortunately there is a builder on site doing various projects. Tomorrow he will construct a new inspection pit, much larger than the old one which will make any future leaks much easier to fix. I got back to the house a few days ago. The heat pump was off and the interior temperature was 14 ºC. I put the heat pump on, and in the usual 3 or 4 days, it climbed to the set figure of 19 ºC. If you have been reading this, you will know that I have had a lot of leaks in the primary. So far the pressure is holding at one bar - hooray. Lets hope the leaks are finally fixed. I noticed that the temperature difference on the primary was higher than usual. I took out the filter on the primary circuit that stops the crud going into the heat exchanger. It was 50% or more blocked. I cleaned it and the temperature difference dropped to the usual 5 ºC. I believe that this has made the heat pump more efficient as it can now abstract more heat from the ground. If you have a system with a filter in the primary, it would be interesting to know how clean it is, and if after cleaning, the temperature difference is less. Its all obvious and predictable now, but I was surprised. When the house was first refurbished 25 years ago, it had a 9 kW resistance heater for the under floor heat. I found that it could just maintain 19°C inside with 0°C outside. As my heat pump was 15 kW, I calculated it could get 19°C inside with -10°C outside. I am going to find this is wrong. First it is not possible to get 15 kW continuously. The pump is an on/off device and continuously raises the temperature until is is shut off by the heating curve calculation, or a temperature limit. So I am getting less than 15 kW. I have tweaked the settings to get it to stay on as long as possible and be off for the least time. The external temperature has varied from -1 to -5°C and the inside is gradually reaching 19°C. I have recently returned to France and the internal temperature was 14°C. With the huge thermal mass of concrete and the low ambient it takes a long time to heat up. Second I am now not sure if the underfloor system is able to transfer enough heat into the building when it is very cold outside. The water temperature in the underfloor pipes varies from 32 to 42°C. If I could keep it at a constant 42°C, I would get a better heat transfer. EDF the electricity supplier are having a bonanza period. With the cold weather they are making every day allowable a 'red day' with the very high tariff. Grrrr. In the early part of this story, there were questions about the bore holes Would they provide enough heat to the heat pump. Well, for that bit at least I think it is OK, just as Paul in Montreal had said it would be. I have 2 x 100 meter boreholes with two loops in each borehole, this feeds a 15 kW heat pump. Following continual use over one week, at worst the supply is +7.1°C and the return +2.6°C. I believe Nibe's specification for COP measurement requires a primary supply of 0°C and an output of 35°C. The heat pump had been working without problems until 5 Jan 2014. I was in the UK and a friend who checked the house regularly told me that it had stopped with a temperature alarm. I contacted the installer, and after a few days he was able to investigate. He found the return temperature from the primary circulator to be minus 8 degrees; In my experience, it had never been lower than plus 2 degrees - clearly a wrong value. This circuit pumps the glycol around the closed loop that takes the heat from the two 100 meter deep boreholes. This value caused the system to shut down. He thought (wrongly) that the sensor was defective and ordered a new one. After 11 days it finally arrived. The result was the same. He found the circulating pump for the primary had stopped working, hence the minus 8 degrees. The pump is a specially made product by Grundfos for Nibe the heat pump manufacturer. A new one off the shelf, can only be purchased from Atlantic, the agent for Nibe in France. Its retail cost is EUR1,572. The pump caused a 4.5 amp fuse to blow and gave off that tell-tale smell of burning electronics. When the system was installed I paid EUR466 to have it set up by an 'expert'. I was not impressed by his 'expertise' but I was also buying 3 years insurance, so fortunately, I will not have to pay the huge cost of the new pump. Finally on 13 February (39 days after the fault was first reported) the new pump arrived. It was smaller than the old one and is marked efficiency 'A' like a fridge. Apparently there have been three different designs of this pump over the years. This must be in my view, because of reliability issues. The pump has a permanent magnet and I assume it is a DC device. The control electronics is in a plastic container mounted on the side of the pump. Its speed can be varied remotely. I have set it to 85% of full speed, this gives a supply/return temperature difference of 5 to 6 degrees. I expect to be presented with a bill for manpower. If/when it arrives, I will ask for a contribution from Atlantic on the grounds of the product having an inherent design defect. As I am in France, I will probably lose. Let me know if anyone is reading this and wants to hear the end of the story. OK thanks for your interest. Things happen slowly here, when something happens, I will let you know. The bill arrived in the post today. 40.00 euros per hour, 7 hours work, plus 20% TVA or VAT. Total 336.00 Euros. I suppose I should be grateful, a heating technician in the UK, would probably be twice the price. I have decided to pay up and keep quiet. The only good thing is that the invoice includes a detailed list of the work done. I wanted to keep the old pump to dismantle it, but it had to go back under the terms of the insurance. In total I believe I have had 4 leaks from brass fittings. This could have been due to defective fittings or plumber over tightening. I suspect the latter. With the constantly fluctuating temperatures, any weakness will be assisted to fail. The most recent a year ago was in the primary. The antifreeze mix leaked out, and the heat pump shut down due to poor circulation. The liquid escape was not excessive but it made the chipboard flooring become like soggy cardboard. Finally this spring time I am going to disconnect the heat pump, move it, fix the soggy floor, and re-install it; rather a plumber and a carpenter are going to do the work. Apart from this, it continues to work well. I find I have to adjust the settings when the ambient is mild and adjust again when it gets cold. I do this to achieve at least 18 minutes of 'on' time for the compressor. I have not found compromise settings that would give 18 minutes minimum in both mild and cold conditions. If anyone has suggestions on this I would be pleased to hear them. Nibe heat pumps have a huge variety of settings - probably too many. For example the heating curve slope can be varied, max and min can be set, overshoot set, a kink can be put in the slope, and more. . . . In previous reports I have complained about 3 or 4 leaks caused by brass fittings cracking and leaking primary or secondary fluid. I believe it was caused by over-enthuistic tightening, the installer says, as you might expect, that the fittings were defective. The most recent leak in the primary caused the pump to stop because of low flow, but more significantly the liquid damaged the chipboard flooring and the heat pump began to list to one side. I had the heat pump and inertial cylinder disconnected, the floor repaired with a better quality product, and the heat pump and cylinder re-installed. One extra bit of equipment was added - a heat meter. It has an ultrasonic device to measure flow, and two sensors that measure flow and return temperature. I gave the system a quick test and everything works fine and I can see that it had produced one or two kW of heat output. In the winter I will note the readings and hopefully be able to measure the COP of the heat pump. I also have a data logger, and hope to use that to give a graphical display of heat over time. As it was a bit chilly, I put the heat pump on for two days. It consumed 29.7 kWh of electricity. It gave 117 kWh of heat output as measured with my new heat meter. This gives a COP or efficiency of 3.94. Or I could say, I bought 29.7 kWh from EDF. I got 87.3 kWh free from the ground. It is now 7 years since my GSHP was installed. In 2015 I added a heat output measuring device. It measures the flow rate of the water by ultrasound and taking the supply and return temperatures calculates the heat output produced. I measure the energy input with a standard kWh meter. I divide the output by the input to get the CoP (coefficient of performance. I am constantly tweaking the parameters to get the compressor run time to be as long as possible. With the mild weather this is difficult. Ground source heat pumps are impractical for some domestic installations, because of groundwork and access issues. Slinky pipes require an area of land approximately twice as large as the total floor area of the house, in order for them to collect sufficient heat, without freezing the ground. If a large area of land is not available, bore holes would need to be drilled. If using boreholes a starting point is to assume 15m/kW required depending on ground type, with a depth of up to 100m being common (eg good for ~7kW max, at ~£25+/m circa 2010), and there is a limit on how close the boreholes can be, no less than a few metres apart. For us with a heated floor area of 76m^2 and total heat demand of ~6MWh/y, a 100m borehole supporting up to 6kW--7kW might be more than enough, indeed 60m for 4kW might do at a pinch, though I'd rather over-specify a bit rather than risk the ground cooling and thus the CoP dropping too far. How many have you sold? How long have you being doing it? How many dedicated staff do you have for this technology? Do you have out-of-hours cover for breakdowns, eg at Christmas? How long is the warranty, and is it externally bonded/backed? See the extended TEG write-up. 2014/05/26: I have been considering supplementing the PV input to my (~4W) off-grid powered SheevaPlug server with direct thermal generation in winter when PV is at its least good; I already have a little bit of wind (my MotorWind array) for this, but thermo-electric generation (TEG) might have an even better anti-correlation vs PV and also have the advantage of being silent and having no moving parts. After a bit of Internet searching I found and prodded two (German) companies, Thermalforce.de (see their "m902 Geothermal probe") and Quick-ohm.de (see their QC-127-1.4-6.0 device) who have very politely humoured me thus far. Efficiency of electrical output maybe ~1% at ~8K mid-winter London air temperature (~2°C) differential from ground temperature (~10°C). Rule of thumb round here for boreholes for ground-source heat-pumps of 15m/kW of required thermal output, or ~70W/m. suggests that a device with a 1--2m heat-pipe might be able to extract <0.7W or (say) ~0.5W of electrical energy mid-winter, radiating and/or convecting away ≥70W to the air (note: the QC-127-1.4-6.0 'cold side' is 40mmx40mm ignoring likely necessary heat-sink), and ignoring details of converting to and transmitting in a form usable by the server. Note (fact alert): the Met Office says that (quoted 2014/05/26) "Mean annual temperatures vary from about 11°C in central London and along the south coast to about 9°C over higher ground well inland" which should be close to my year-round ground temperature at reasonable depth, and "January is the coldest month, with mean daily minimum temperatures varying from over 3°C in London and along the coast to about 0.5°C over the higher ground" which means that I probably have somewhat less differential to play with than in my initial assumptions above. The horrors of a mild maritime climate! which looks like I might hope to get ~100mW continuous output in the depths of winter (I'd need 40 to power my SheevaPlug)! By comparison, PV is lucky to get 1 sun-hour per day equivalent at that time, so a capacity factor of perhaps 4% or less, so 100mW of thermal-electric generation (TEG) is maybe worth ~2.4W of PV, and possibly a little more since a battery might not be required with TEG, the ground's thermal mass itself being storage. Note that according to weather data (for nearby EGLL/Heathrow) c/o degreedays.net, over the last 36M (1121d) the number of days below a baseline of 5°C, ie at which the above device might hope to generate something of use, is 287 or about 95 days per year, and provides good (not complete) coverage over the Nov/Dec/Jan winter PV low. 2018/12/06: Review of Heat Pumps in Ireland. 2016/02: Analysis of data from heat pumps installed via the Renewable Heat Premium Payment (RHPP) scheme to the Department of Energy and Climate Change (DECC). 2014/08/11: DECC: 40 English urban rivers good for water-source heat pumps for heating/cooling. 2014/08/11: Environmental good practice guide for ground source heating and cooling. 2013/08/07: Detailed analysis from the second phase of the Energy Saving Trust's heat pump field trial: "minor interventions had no effect on performace", mean SPFH4 (weighted CoP) was 2.82 for GSHP and 2.45 for ASHP. 2013/03/27: Manufacturers can play a key role in preventing problems with heat pumps. Energy Saving Trust 2010 heat-pump field trial: "well-designed and installed heat pumps can operate well in the UK", GSHP had CoPs slightly better than ASHP at ~2.4 vs ~2.2, but the best of both above 3.0, "performance is sensitive to installation and commissioning practices" (which are very often not good enough it seems). A typical "rule of thumb" is to use 13m [to 15.5m+] of vertical borehole per kW of required output. "Typically, the price range is from £50 to £75 per metre [in 2008]. Drilling into a dense hard rock such as granite will yield about 70W/m i.e. 100m borehole = 7kW however, a soft dry chalk may only provide just over half this amount of energy. These outputs are based on a single loop probe and where double loop probes are used (4 pipes down one borehole) these can provide approx 15% more energy." Case study, ecovision chez D&P Hart-Davis. Ice Energy Heat Pumps Ltd.
Heat-pump calculator spreadsheets and discussion of viability at heatpumps.co.uk. The UK's Ground Source Heat Pump Association information. Energy Saving Trust (EST) page on ground-source heat-pumps. UK government BERR (ex-DTI) information on heat microgeneration including ground-source heat-pump. Private communication with BERR 2008/08/27 indicates that (a) GSHP is by far the largest heat-pump sector in the UK and (b) GSHP installations in 2008 numbered well under 10,000. Maybe ground source heat pumps [are] not so green? Installed cost of GSHP is approximately GBP1/W of heat capacity as of 2007. See the on-line PVGIS Solar Irradiance Data tool. First published 2007-11-07 , updated 2019-04-21 . Site copyright © 2007-2019 Damon Hart-Davis. Hosted by ExNet.